How would you like a new smart phone this Christmas? Well today just might be your lucky day. The ALCATEL ONETOUCH Elevate, priced at $99.99 (plus tax) is powered by a Qualcomm Snapdragon™ quad-core processor and features a 2,000mAh battery. • Android 5.1 Lollipop: ALCATEL ONETOUCH Elevate features Android 5.1 Lollipop, providing users an enhanced multitasking experience, complete with the Google Now Launcher, which brings “OK Google” voice commands and content like local weather, directions and upcoming calendar alerts right to your home screen. • 4.5-inch FWVGA display: Perfectly portable compact form factor easily fits into purse or pocket, but still provides a large quality screen for staying connecting on-the-go. • 5-megapixel auto focus camera with LED flash and 2-megapixel front camera: Never miss a moment with Elevate’s 5MP camera, or enjoy video chatting or capturing the perfect selfie with the phone’s 2MP front camera. • 3G/4G LTE/Enhanced LTE3: ALCATEL ONETOUCH Elevate brings the power of LTE to the masses. Browse the Web, download a game or upload a photo with faster 4G LTE speeds. • Quad-core 1.1GHz processor: Powered by a quad-core processor, Elevate delivers smooth performance with low power consumption, so you can rise above whatever the day throws at you. 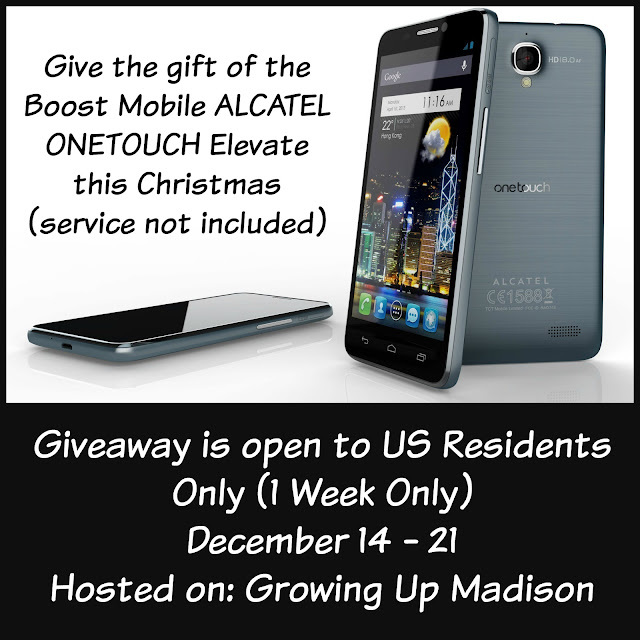 One lucky winner will win the ALCATEL ONETOUCH Elevate (Service Not Included) from Boost Mobile. Winner will be randomly selected by PromoSimple and will have 48hrs to claim prize. Prize is sponsored and will be delivered by Boost Mobile. Good Luck! If I win I could finally get rid of my old cell phone, it's done it's job but it is on it's last leg. I've had Boost for many years now and I'm pretty happy with my service from them. Works everywhere I need it. I'll replace my old phone that doesn't have web access.